On a very hot day, I found a spot on some rocks with still water and lots of fascinating reflections. The pattern of piles under the walkway was very complex and I spent most of my time trying to get them to work with their reflections. I worked on the sky more when I got home. 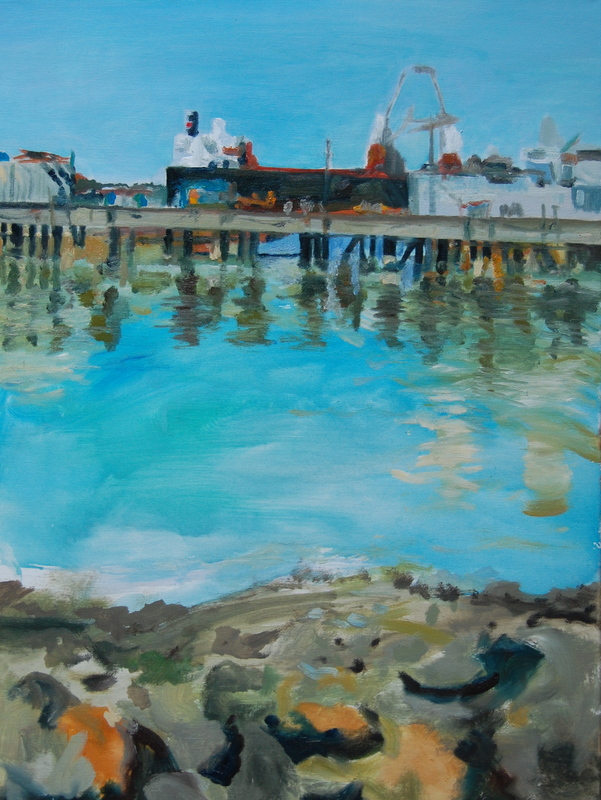 I had made it very flat with just a wash of ultramarine, so I added a thin glaze of cerulean blue and that seemed to connect the sky and the water a bit more. I was going to work on everything else but decided to leave well alone. Oil on canvas 18 x 24. This entry was posted in Art Journal and tagged Alameda, Fran Osborne, landscape, oil. Bookmark the permalink. Hey petey – I am so thick with thought that my head hurts.